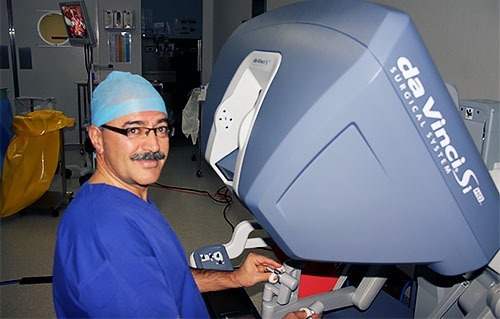 Dr Katelaris trained in robotic surgery in the United States. He has introduced it into his practice for carefully selected patients. Robotic kidney surgery is particularly useful for performing the operation of partial nephrectomy.Patients suitable for partial nephrectomy are those who have a kidney cancer of a relatively small size which is located in the upper or lower pole of the kidney. Partial nephrectomy enables the amputation of the affected part of the kidney whilst generally preserving between 60 to 80% of normal kidney tissue. Traditionally partial nephrectomy is performed via a large flank incision that necessitates an in-patient stay of 7 to 10 days. Robotic partial nephrectomy generally facilitates discharge after 2 to 3 days and early return to work and other activities. 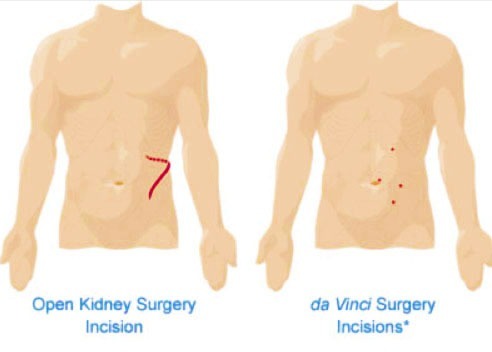 Incisions for laparoscopic kidney surgery. Robotic kidney surgery is also suitable for performing minimally invasive pyeloplasty, this is for repair of an obstructed pelvic ureteric junction which controls the outflow of urine from the kidney.